The marketplace – a reflection of the soul of the people. It is a sensatory explosion of smells, tastes, sights and sounds. Cambodia’s markets are a microcosm of its culture and society – they embody organized chaos, immersing one in the passions of everyday life. Market – Disoriented is a collaborative exhibition by artists Dina Chhan and Takakazu Yamada which explores the theme of Cambodia’s market as the archetypal element of Cambodian culture and authenticity. Strolling through one of Cambodia’s markets can be a disorienting experience: the anarchic cacophony of chatter, narrow compartments filled with fumes from the nearby food stalls, the endless labyrinth of clothes, shoes, fabrics or household goods. Yet in the hustle and bustle of the market, one can observe a realm of stories, relations and interactions which reflect the soul of Cambodian culture. It is this very depth which artists Dina Chhan and Takakazu Yamada seek to render through a juxtaposition of their contrasting styles and techniques. Artist Dina explains that the identity of Cambodia is seen inside and around the market. “It is part of everyday life. We thought it would be best to paint about something that is very Cambodian.” “It is the liveliness of the Cambodian people that I always feel in the market” adds Yamada. Through this comparison, the artists aim to celebrate the friendship between the two countries. “We hope that Cambodian people also see this art, we want people to see that all of our imaginations are different and exciting”. This exhibition is a tribute to 65 years of friendship between Cambodia and Japan. Opening at the Lotus Pond Gallery, Plantation, Phnom Penh, Cambodia. The exhibition will open on Thursday the 8th of February 2018 and continue until 19th of March 2018. On several trips to Phnom Ta Zoo in Takeo province, painter and sculptor Chhan Dina was left saddened. While people flocked to see animals from around the world, she lamented the lack of native Cambodian wildlife on display. “I really want to see the Cambodian birds and animals, but I was disappointed because I didn’t see any,” she said yesterday at a hotel in Phnom Penh. While she admitted that she did not always have an appreciation for animals, a trip to Prek Toal bird sanctuary on the north-western edge of Tonle Sap Lake with the Wildlife Conservation Society (WCS) almost a decade ago helped sway her. 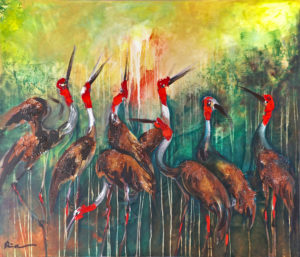 The beauty of the giant ibis and sarus cranes she saw on that trip became seared into her memory and formed the basis of her latest exhibition, “On the Verge of Extinction,” which opens tonight at InterContinental Hotel’s Insider Gallery. The giant ibis and sarus crane species are classified as critically endangered and vulnerable respectively, according to the International Union for Conservation’s red list. The giant ibis, despite being given near mythical status due to its size of up to 100cm tall, has suffered due to hunting, lowland deforestation and habitat loss, according to the World Wildlife Fund. Meanwhile, Cambodia is one of the last population strongholds for the sarus crane, according to WCS, which are dependent on flooded grasslands during their breeding season and permanent marshlands for feeding during the non-breeding season. Dina hopes her work will encourage and inspire Cambodians, not only to become more aware of their own wildlife, but also the creative and critical value of art itself. “I want people to understand what is beautiful in Cambodia,” she said. Dina has carved out a global career spanning 15 years thanks to her dynamic and abstract sculptures and paintings, with her latest exhibition being no exception. 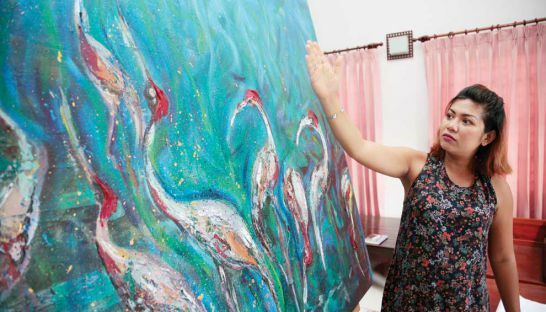 Using French-sourced oils that can take up to six months to dry on the canvas, she depicts surreal and vibrant wetland landscapes, where cranes and ibises flock and feed, in what she hopes will evoke a sense of national pride. She says she believes Cambodian attitudes to art are changing, especially among young people who have more access to artistic education. “Eight to 10 years ago, art was not the highest priority, but now art is becoming more important, more popular, even abstract stuff,” she said. Last year, she was named as one of four artists to join Cambodian Living Arts Fellow Program, which aims to nurture the artistic talents of young Cambodians. While Dina never saw herself as a leader, she feels that as a female artist she can set an example, showing women that the realm of the Cambodian artistic world is not only for men. “We believe in ourselves and we can do it by ourselves and I think most women now can be independent, so they can have the choice of becoming an artist,” she said. It is this change that she hopes will encourage new artists to depict the natural beauty of the kingdom and the wildlife that inhabits it, while it lasts. “They’re one of the beautiful things we have left in Cambodia and people need to see this remaining beauty, so I think as an artist I want to share this message to people,” she said. Against thick swathes of oily greens, cranes with scarlet crowns are dipping and diving for their supper, the insects rendered in blots of ink and flecks of gold leaf. 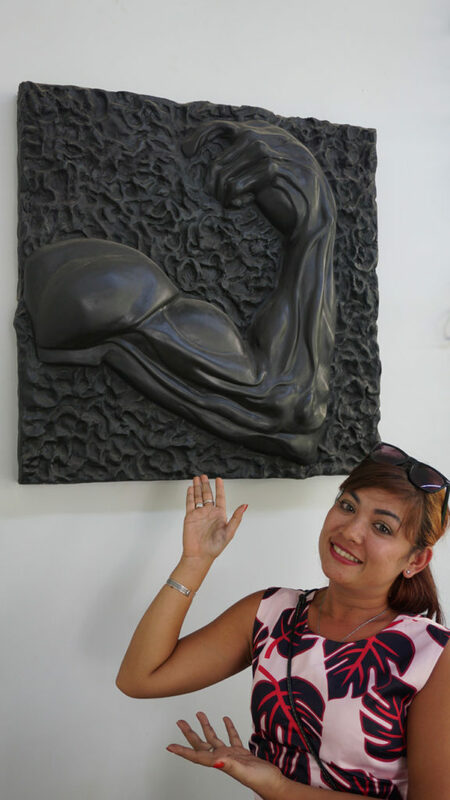 The canvas is one of the most striking works in a new exhibition from Cambodian sculptor and painter Dina Chhan, which is set to open on Thursday. Dina, who has taken the name of her fiancé and now signs her name Dina Daly, has in the past dedicated her work to representations of women and abstract animals. But she chose to hone in on the crane and ibis, recurring motifs in her work, for this latest exhibit, titled “On the Verge of Extinction”. Over cups of milky tea, Dina says she was inspired by a trip she took to flooded forests and the efforts of conservationists to protect the species in Cambodia. “We had to go there by boat and look through a telescope. All the trees are full of birds – we could no longer see the trees,” she says. She was also touched by the images of birds etched into the temple walls at Angkor Wat – highlighting a long lineage of Cambodian reverence for the crane. She has now carved out a space for herself in that tradition. Although it is easy to lament the destruction of forests and several species of animals from Cambodia due to long bouts of unfettered logging, hunting and climate change, Dina says she wanted to celebrate what the Kingdom has managed to hold on to. “This makes me proud of my country, that we still have these birds left,” she says. She hopes by immortalising them in art, others will deepen their appreciation for their species and bolster attempts to protect them. Sarus cranes are a vulnerable breed; there are fewer than 1,000 of the birds estimated across Cambodia, Laos and Vietnam. In Dina’s work, too, they can be elusive – just visible through long stripes of painted grass – or hidden in a fiery palette with angular lines. Another painting manages to capture both the essence of a galaxy and the texture of cracked earth. The past few months have been a flurry of creativity for Dina, who is painting as much as possible before the upcoming arrival of her first child. Dina was also honoured as the Kingdom’s top young artist at the CLMTV (Cambodia, Laos, Myanmar, Thailand and Vietnam) Contemporary Artist Awards held in Thailand in February this year. Her latest project, she says, has allowed her to spread her wings. “I feel like painting is freedom. You can show expressions or experiment,” she says. On the Verge of Extinction opens on Thursday, January 5, 2017 at 6pm at the Insider Gallery, InterContinental Phnom Penh and runs until February 1. I am a Khmer sculptor and painter. Hopefully you’ll recognise my unique artwork from various exhibitions around Southeast Asia and further afield. I eat, sleep and breath art. You spent some of your early childhood in a refugee camp on the Thai border. Can you tell us about your early life and what led you on the path to becoming an artist? Although I was born in Phnom Penh, my family was forced out of the capital to a refugee camp in Poipet. Life for everybody in Poipet was constantly risky, largely due to vast amount of land mines scattered around the province. I remember walking to school on tiny tracks between fields that were littered with warning signs about buried explosives. We would frequently hear explosions. Children, farmers, cows, dogs would perish by accidentally straying into a restricted area. Luckily when I was nine my family returned to Phnom Penh. I met Mr Ron, an American artist that lived nearby. He saw me playing with dirt and modelling figures from clay. 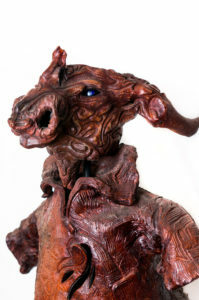 He shared sculpting techniques with me and taught me how to sketch. He encouraged me a lot. Who are the artists that have inspired you the most and why did they inspire you? I am heavily influenced by everyday life and activities. I collect fine art books at every opportunity, I have an expanding library, from Matisse, Rothko, Van Gogh, Constable to Escher. Many of the great artists were so poor, they created because of their love of art. I love expressing myself though colour and shapes. Creativity before money! I’m inspired by the world around me. I regularly visit the provinces to observe farmers, boat builders, the markets. I love nature, I love animals and the environment. I hope I can bring important environmental issues to peoples minds. I am also inspired and encouraged by other artists. I’ve visited Beijing, Dublin, London, Bangkok, I spend countless hours and days in every kind of gallery and art shop. What is the reaction from ordinary Cambodians when you tell them you are an artist? Some are very supportive and encouraging. Many are indifferent. They find it difficult to relate to my abstract works. If subjects in my creations are not instantly recognisable, people are baffled as to why I would create such strange depictions. Are male artists are more accepted than female ones in Cambodia? Are you breaking any cultural stereotypes by working as an artist? Many people think that being an artist is for men only. Either way, becoming an artist is not easy. It takes full-time commitment. [Art] will consume your entire heart and soul, you have to make massive sacrifices to accomplish your vision. Even when others around you don’t understand you, they don’t take you seriously. They don’t realise the power of art. 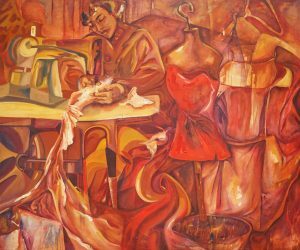 Why so you think art in general is under-appreciated in Cambodia? Do you think that’s changing? Most people are trying to survive, art is not a consideration. I know we need to move on, but you must remember everything was destroyed [in the Khmer Rouge era]. There’s very little for us to build on. But this could be turned to our advantage. There is a new wave of artists and we’re changing things. The future is bright. What has been your proudest achievement so far in your artistic career? Every time I have the opportunity to create, produce and display my creations in public. I hope people view my work and are inspired about the subjects that are dear to me. My creations are on display all over the world, from Washington DC to Wellington. What does gaining a CLA fellowship mean for you? It helps me to discover more of who I am as an artist. To develop leadership qualities in order to help the youth in our communities. These programmes encourage Cambodians to become involved in visual and performance art, something we desperately need as we develop as a nation. 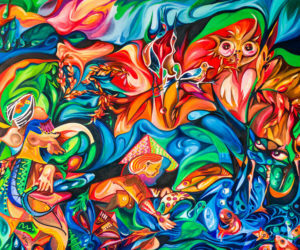 How do you think Cambodia’s art scene will develop in the next five years? If nurtured it will continue to grow. We need more galleries, museums and educational facilities though. And we need much greater focus on women in the arts.